I don’t do much baking in the summertime. But there’s always one thing that finds its way into my oven in July; that’s zucchini bread. This season I changed up tradition to create a chocolaty concoction. The result: it’s a keeper! Why it’s better for you? Whole grains and cocoa! Disclosure Note: I’m on the Pistachio Health consumer advisory board. I’m not paid for this posting. All recipe choices and opinions are my own. Preheat the oven to 350°F. 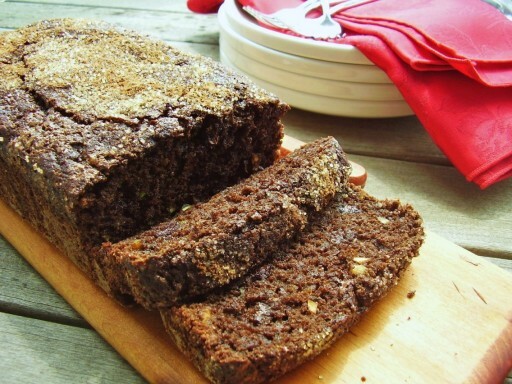 Lightly brush a 9- x 5- inch loaf pan with 1 teaspoon of the grapeseed oil. Dust with 1 tablespoon of the flour. Whisk together the remaining 1 1/4 cups flour, 1/3 cup of the cocoa powder, the baking powder, baking soda, salt, and cinnamon in a medium bowl. Beat the eggs, the remaining 1/4 cup oil, 3/4 cup of the sugar, the mashed banana, extracts, and orange zest with an electric mixer on medium speed in a large bowl. Add the flour mixture and beat on low speed until just combined. Stir in the zucchini, chocolate chips, and pistachios until evenly combined. Transfer the batter to the loaf pan. Dust the top with the remaining 1 teaspoon cocoa powder and sprinkle with the remaining 1 tablespoon sugar. Bake until springy to the touch, about 55 minutes. Cool in the pan on a wire rack for 20 minutes. Remove the bread from the pan and completely cool. Cut into 18 slices and serve at room temperature.